The word "liberal" has been so tainted by 8 years of far-right imperialism that it doesn't mean very much in US politics today, and, all in all, it's not something that I dwell on too often. When Americans-formerly-known-as-liberal added progressivism to the mix, the ambiguity of the left compounded further in my mind. Political distinctions are sticky, and perhaps (just perhaps) they are easier to quantify through the lens as an anthropologist whilst gazing at some smaller-scale society somehow distant from our own political leanings and aggravations. But turn the lens on ourselves and we swim in a quagmire of fine lines and monumental ruptures. What does it mean to be progressive in politics? Is there such a thing? Aren't all attempts at progress - elitist or otherwise - simply marred by political agenda? The truth is that I'm not excessively political or that concerned about political demarcations, which I find as arbitrary as they are ambiguous in a country that imagines itself more polarized than it truly is. I've also been more or less out of the loop in terms of my home country's political affairs for the past 8 years (coincidence?) that I've been abroad. It takes some inspiration, then, for me to blog on politics with any fervor, but I found the following article from Nate Silver at 538 to be a thoroughly good read. The definitions of the terms “liberal” and “conservative” have been the subjects of much debate in contemporary American politics. But it has become increasingly clear that the term "progressive" is equally ambiguous, and is associated with at least two relatively distinct philosophical traditions. Although these two "progressivisms" share common ground on many (probably most) issues, they are at loggerheads on some others, as has perhaps become more apparent since the election of President Obama. Rational progressivism tends to be trusting, within reason, of status quo political and economic institutions -- generally including the institution of capitalism. It tends to trust these institutions because it believes they are a manifestation of progress made by previous generations. However, unlike conservatism, it also sees these institutions as continuing works in progress, subject to inefficiencies because of distorted or poorly-designed incentives, poorly-informed or misinformed participants, and competition from 'irrational' worldviews like religion. It also recognizes that certain persons who stand to benefit from preserving the status quo, particularly elected officials but also corporations, may seek to block this progress to protect their own interests. The project of rational progressivism, then, is to propagate good ideas and to convert them, through a wide and aggressive array of democratic means, into public policy. The second type of progressivism is what I call radical progressivism. It represents, indeed, a much more radical and comprehensive critique of the status quo, which it tends to see as intrinsically corrupt. Its philosophical tradition originates in 19th Century thought -- and specifically, owes a great deal to the Marxist critique of capitalism and the Marxist theory of social change. It also finds inspiration in both the radical movement of the 1960s and the labor and social movements of late 19th and early 20th centuries (from which it borrows the label "progressive"). Radical progressivism is more clearly distinguishable from "conventional" liberalism and would generally be associated with the "far left" -- although on a handful of issues such as free trade, it may find common cause with the "radical" right. Radical progressivism embraces the tradition of populism and frequently adopts a discourse of the virtuous commoner organizing against the corrupt elite. It is much more willing to make normative claims than rational progressivism, and tends to view conservatism as immoral and contemporary American liberalism as amoral (at best). Its project is not reform but transformation. It should come as no surprise that I regard myself as a rational progressive. I believe in intellectual progress -- that we, as a species, are gradually becoming smarter. I believe that there are objectively right answers to many political and economic questions. I believe that economic growth is both a reflection of and a contributor toward societal progress, that economic growth has facilitated a higher standard of living, and that this is empirically indisputable. I also believe, however, that our society is now so exceptionally wealthy -- even in the midst of a severe recession -- that it has little excuse not to provide for some basic level of dignity for all its citizens. I believe that answers to questions like these do not always come from the establishment. But I also believe that it is just as important to question one's own assumptions as to question the assumption of others. The truth is, I don’t particularly care whether you call me a “progressive” or not. In fact, I'm suspicious of people who line up on the same side of the ideological divide on every single issue. The world is more complicated than that, especially when one strives to see the world through a scientific, empirical lens. While progressives, in my view, clearly have the preponderance of good ideas, they do not have a monopoly on them. Nor do conservatives have a monopoly on bad ideas, especially when radical progressives flirt with Marxist modes of discourse. Let me be very clear about what I am saying. I believe that our country needs a lot of work -- a lot of work -- almost certainly more work than Barack Obama is going to be able to accomplish in four or eight years. I believe that greater awareness and greater participation on behalf of everyday citizens is almost certainly a necessary condition to facilitate that work. To the extent that blogs, political campaigns, church groups, labor unions, and whatever other organization you can think of can coalesce that participation and turn it into a "movement", I am all for the "movement". I find the binary distinction employed by the author to be helpful, even if it has me crying tertium non datur. 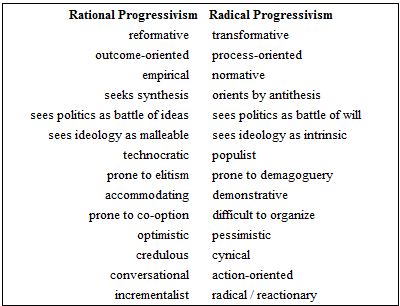 Despite the false dichotomy, I feel like I fall towards the "rational" progressive line. I respect that it wasn't written as a comprehensive layout of the leftist political spectrum as much as a review of two opposed, yet overlapping, approaches grown from the same sources of discontent to achieve the same ends but by different means. Perhaps the terms "rational" and "radical" imply some inherent value judgement which could obscure for some what I see as the greatest benefit of his two categories: the opposing features are ascriptive rather than self-ascribed. I find that all the more appealing and less glorifying, despite critics of the article who felt otherwise. Still, perhaps "rationalizing progressivism" and "radicalizing progressivism" better describe the nuanced tendency and conflicting standpoints. All in all I found the summary to be surprisingly un-self-satisfying in unifying outsider views with an inside perspective. I believe in intellectual progress -- that we, as a species, are gradually becoming smarter. The jury is still out. My pessimistic cynicism places me squarely in the radical column there. I don't find fault with the fact that my own version of progressivism (which I hardly knew I harbored) is spread out across the board. Actually, I find it comforting. Equally fun are the comments which follow the original post, all of which are well worth reading. 538 has an excellent reader base. Someone elect them all to congress. Even especially the pedants. If one hundredth the level of that kind of informed debate were available on the evening news, perhaps we would really be getting smarter after all. Or is that just my rationalizing progressivist self being overly optimistic and prone to elitism? NB: I hate that this is dated now, but my thesis writing is picking up, so most of my posts sit in draft for a few days/weeks. Damn the blogosphere and its annoying timeliness.